Find the perfect jump starter that works when you need it! Jump starter has one main purpose – to work when you need it. Stranded in the middle of the night, miles from the closest mechanic or even another car. You need something that won’t let you down and will work in all conditions when your battery got depleted or died entirely. Most batteries last for about two to five years. After that, your battery needs to be replaced. Failure to do so will lead to unwanted situations–you might not be able to start your car just when you need to leave badly. 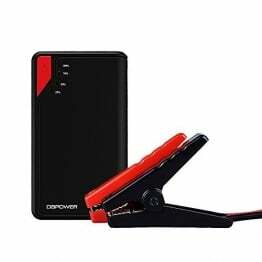 The higher the peak amps, the more power the jump starter battery can feed in a hurry to your low battery to boost it for starting. Amount of power that a battery can discharge for 30 seconds at 32° F (0° C). It really is the amount of power you need to start your engine on any weather except winter. Number of amps that a battery can push out for 30 seconds at 0° F without dropping under 7.2 Volts. 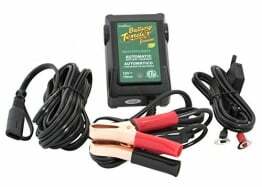 Be it for a truck, car, RV, motorbike or a boat, once in a while the battery just gives in and you need a reliable helper that gets you out of a potential trouble. Knowing how to use a jump starter when you need it is equally important as having one. 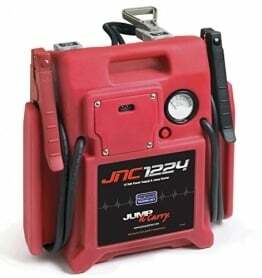 7 tips how to use a jump starter correctly. a) The jump starter usually needs over 50% charge to jump start. b) Connect the jump starter directly to the battery terminals. Do not try to extend the cable length with a regular set of jumper cables. c) DISCONNECT within 10 seconds of the car starting if at all possible. But don’t worry: the majority of jump starters have a built-in protection feature to shut it off if left connected too long after the car starts (see # 2 below). After jumping a car battery, the jump starter’s safety features occasionally kick in, rendering it inoperative until reset. We highly suggest that AFTER any jump start you disconnect the Jump starter and then check its charge level. If the charge level is low, simply plug it into a house AC outlet, or use the car adapter (cigarette lighter). 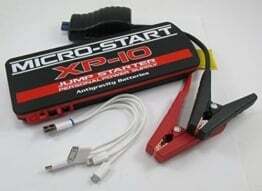 The jump starter should reset itself and become functional as soon as it has sufficient charge. When there is adequate charge you can then unplug and use it again immediately. If you have your DC adapter for the jump starter (fits the cigarette lighter), you may be able to perform this reset with the vehicle you just jump started! Just make sure the car is running. In some cases, the protective cover (rubber flap) for the jump start cable connection may be very difficult to open when fully shut. You need a thin, pointed object to pry it open from the rounded end. Just be careful not to damage the connector inside. I suggest trimming a little off the end of this rubber cover so you can more quickly open the cover with a fingernail or car key. Be sure not to cut the rubber protrusions inside, because they are designed to protect the 12v connector. With some jump starters you must HOLD the power button for 1-2 seconds to cycle through each of the LED torch modes (on, strobe, SOS, off). When attaching devices to the USB charging port( s), be sure to briefly press the Jump starter’s switch or your device may not be charged. 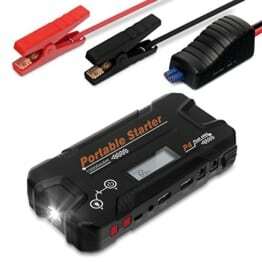 The Jump starter’s charge lights will come on indicating its battery level, but one of them will show RED. This implies you are in USB charging mode. When all USB devices are completely charged, the Jump starter will cut power to the USB slots and go into standby mode. To resume charging, simply press the Jump starter’s button once again. Recharging your jump starter is similar to any mobile phone or ipad: plug it into an AC outlet, or your car’s DC electrical outlet (cigarette lighter) and wait for it to be charged fully. In some cases, the Jump starter seems to get “stuck” at the last charging stage (last 1 or 2 bars still flashing). If you disconnect the Jump starter charging cord, then reconnect it and wait a minute, you might find the battery is fully charged. 7. READ the owner’s manual. This describes how to correctly use the Jump Starter. It usually has recommended TEMPERATURES for use and storing. Do not store in direct sunlight inside a hot car! Bear in mind that the jump starters are NOT designed to operate 12-volt devices and can not substitute your car battery. 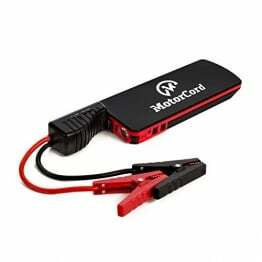 They are intended to provide charging power TO the BATTERY in your car or device. This is why a dead car battery may not crank the instant you connect the Jump starter. It needs a little bit of time to push energy to the battery.